Brush up on your knowledge on crew and module positions! Test how much you remember during every battle and be awarded with a Bruiser medal for a chance at this week's prizes! Submit a screenshot of the Personal Score tab of the in-game Battle Results screen showing the week's featured medal. 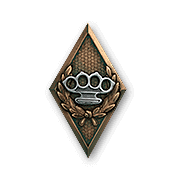 Damage enemy modules and/or knock out their crew members at least 5 times in the course of the battle. Modules damaged by fire count. Only one award per player per battle possible. Available in Random Battles only. Strictly one screenshot per entry/comment.